Brisbane outdoor living – start planning for a very special new year! If ever there was a capital city with a climate suited to outdoor living it’s got to be Brisbane. And with the end of one year and the start of another traditionally the time when people make New Year resolutions, this year why not make a resolution that will make a difference for your entire family: Resolve to build yourself a new Brisbane outdoor living area. 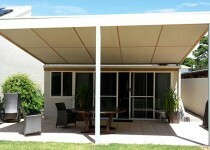 January is a great time to plan a new outdoor structure. Firstly, if you’re lucky enough to have holidays, you’ll have the time to get outside with all the members of your family and start planning your Brisbane outdoor living area. Are you after a large area for regular gatherings or a more intimate area for small family meals? Where will you place your BBQ and outdoor furniture? Is privacy an issue that you’ll need to fix? Will you develop a surrounding garden area and possibly even install a water feature for an area that’s peaceful as well as practical? You should also consider the style of structure you want and what materials you’ll use. A good start is to have a look at your house as the style should either match or compliment your existing structures. January is also a good time to consider the summer sun, so take note of the direction that your Brisbane outdoor living area will face and whether you need to provide protection, particularly from the hot west sun. Don’t forget to also think about cooler weather and the direction of your predominant winds. Once you have a good idea of your needs, it’s time to give Outside Concepts a call. We can sit down with you to discuss your requirements, including how to get the most from your budget. Best of all, we can take care of everything for you – from council plans through to clean up. In fact, we can help you make your dream a reality a lot quicker than you think!